Celtic designs are fairly universal, in that they go well with just about any theme you can imagine. This Celtic Knot Expandable Sword Hanger serves well as a means to hang up your favorite sword or other weapon for display. Sold as a set of two, these round sword hangers feature intricate Celtic knotwork that will complement almost any sword, axe, dagger, or firearm. Expandable to fit different sizes and shapes, these wall mount sword hangers are also spring-loaded for a secure hold. 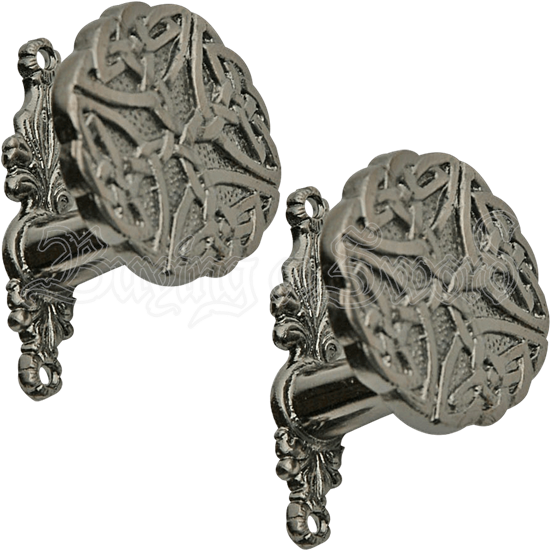 Made of cast metal, they feature a darkened silver finish. Included with the pair of hangers is sufficient hardware for easy installation. Celtic swords and Viking swords look particularly good with this Celtic Knot Expandable Sword Hanger, although that hardly discredits other weapons, which will look just as good thanks to the universal appeal of the Celtic knot pattern. Great product. I have been in search of such an item for two years. Your website is now in my favorites ! !